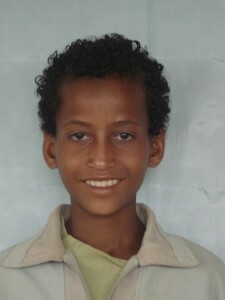 Chernet in 2008 (age 10), upon enrollment in the CHADET sponsorship program through Canadian Feed The Children. In early 2013, we brought you the story of sponsored child Chernet – then a 14-year-old youth who lived with his older brother (both parents died when Chernet was just a young boy). Today, he’s a well-rounded young man: a top student, and an avid soccer player and fan. We catch up with Chernet to find out how he and his brother are faring in the small community of Woliso, just outside Addis Ababa. Now almost 16, Chernet has benefited from CFTC’s child sponsorship program since 2008. With the extra care and support he’s received, Chernet is heading toward adulthood – graduation from school, and also from the sponsorship program that has enriched his life immeasurably. It certainly could have been far different for him, as it is for thousands of other children who remain in precarious living conditions in Ethiopia and elsewhere. Children like Chernet, left in the care of older siblings who are barely adults themselves, are especially vulnerable as the pressure simply to survive makes it impossible for them to attend or stay in school and obtain an education. In urban environments without strong community support and social services, these children fall through the cracks – their childhood stolen from them by the daily struggle they face to feed, clothe and care for themselves. They reach adulthood (if they reach adulthood), often in poor health, unable to make up for the deficits they’ve experienced physically and emotionally, and with few skills and little opportunity to make a better life for themselves or for their own children. Child sponsorship is, literally, a life-saver: it provides a critical ‘safety net’ that allows children like Chernet to survive and thrive. Here’s a glimpse at his life now – which is not without hardship, but which holds plenty of joy and opportunity for him now and going forward. Tell us about your living circumstances right now. Both my parents were deceased when I was a small child and I live with my elder brother. He is 25 years old and works as a day labourer in a factory. He is the one who covers the costs of our living like house rent, food, and so on. I sometimes work on a construction site as a daily labourer, especially during the summer vacation to cover some of my needs like clothes, shoes and the like. I do most of the household chores like preparing food, cleaning the house, fetching water and washing dishes. My brother can’t assist me usually due to the nature of his job. He leaves the house early in the morning and returns in the evening. Do you go to school regularly? What grade are you in? Yes, I am attending my education regularly and I’m now in grade 9. How has the sponsorship program through local partner CHADET assisted you? I have been registered as a sponsored child and enrolled in the program since 2008. The program has assisted me in various ways each year since my registration including full scholastic material support, school uniform, award materials, books and medical assistance. Besides this, I have been participating in different extracurricular activities organized by the project like sport festivals, celebration of the Day of the African Child, and book reading clubs. How has your life changed since being sponsored? 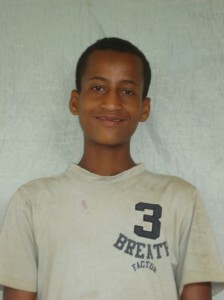 Chernet, in his annual child sponsorship photo in 2011. My life has changed in different ways since my engagement with the program, but the most remarkable one is the fact that I am able to attend my education regularly. The school supplies provided for me through the program is a great help because I don’t have to think [about where to get] exercise books and pens like before. Previously, since both my parents were deceased, my teachers and other rich people in my community bought school supplies for me. I have been using a single exercise book for three or four subjects. Since I didn’t have enough school supplies; I used to occasionally quit school. But now thanks to this program I am able to get all necessary materials for my education including uniform, which I never imagined before. The support from the project and the encouragement of the project staff have strengthened me to succeed in my school performance. Last year I transferred from grade eight to nine recording high score and ranking fourth from 73 students in my class. The project has awarded me a dictionary and a school bag; this motivates me to further improve my school performance. Besides, the program has assisted me to be involved in other activities like educational tours, different sports activities, and participating in a reading club. I also have the opportunity to use the library at CHADET. Even if I want any reference books; I can borrow for three or four days and return it back to the library and borrow another one. What do you eat each day? What is your favourite meal at school or at home? We usually eat, almost each day, shiro with enjera. We prepare the stew (wot) at home and we buy enjera from Guliti (small market) around our home. My favourite meal is vegetable food. I eat vegetables, especially during summer season as we get it with minimum price. What is your favourite thing about school? What is your least favourite thing? Playing with my friends and discussing different issues is what I like most about school. I play different sports with my friends. We discuss different things like football and sport club activities in England, Spain and other countries. Sometimes when I get money I love to watch football games on TV. I am a supporter of the Barcelona football team. What I dislike about my school is its distance from my home. I have to travel not less than five kilometres to go to school. Especially when our shift is in the afternoon I don’t like the searing heat from the sun, and other times the cold wind, etc. What is your favourite subject? What do you like best about that subject? I like biology most because its contents are easily understood as compared to other subjects. Actually I understand almost all subjects very well, but biology teaches me more about myself and the environment around me. It helps me to know about my body, the environment and the interrelationship of different organisms in the environment. Is there something you’ve done at school that you’ve been most proud of? 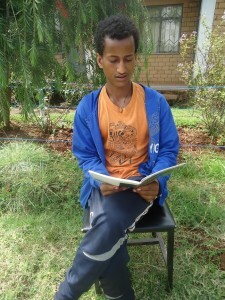 Chernet reads outside the CHADET office in Woliso Township, Ethiopia in April 2014. Since my engagement with this program I have been in the award list at different academic years. So I took at least three awards over the past few years as one of the outstanding students in my school. I also got an award both from school and CHADET during a question-and-answer competition among students of different schools. This all makes me proud. What is your favourite thing to do outside of school? What are your favourite games and hobbies? Playing football is my favourite thing outside school. I usually play during the weekends and I spend two to three hours each day. Beyond this I do different body building exercises like sit-ups and push-ups with other students in my area. I want to be an engineer when I grow up. So far I am good with my school and if I keep it this way I will achieve my dream.